What is this, you ask? Why, a peppercorn, of course! My Dad is visiting right now and he and I both love fresh ground black pepper, especially on our salad greens. It dawned on me yesterday that I had no idea where it comes from or what it looks like in its fresh state. 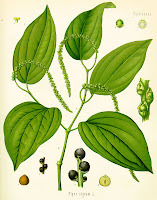 Black pepper (Piper nigrum) is a flowering vine (pictured) and its dried fruit are peppercorns. The plant matures in 4 or 5 years and bears fruit for 7 years. Black peppercorns are harvested before they are ripe, washed, and dried. Green peppercorns are picked before they are ripe, but treated to retain their color. White peppercorns are also unripened, but are soaked to remove the outer skin. Red peppercorns are ripe and preserved in brine before being similarly processed and treated to retain their color. Pepper is one of the most common spices in European cuisine and accounts for 1/5 of the world's spice trade. Its flavor is best retained when kept in an airtight container out of sunlight - and ideally when freshly ground. 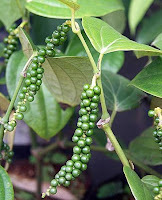 Pepper is native to India, where it has been used since prehistoric times and where the International Pepper Exchange (the only organization that deals with the global exchange of black pepper) is located. But today, India produces 19% of the world's pepper, with 34% being produced and exported by Vietnam - which uses almost none of the product domestically. The rest is produced in Brazil (13%), Indonesia (9%), Malaysia (8%), Sri Lanka (6%), China (6%), and Thailand (4%). 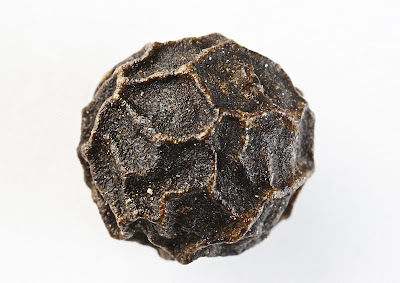 Although it is not known how pepper reached the Nile in ancient times, black peppercorns were found stuffed in the nostrils of the mummy of Egyptian pharaoh Ramesses II (c. 1303 B.C.-1213 B.C.). Attila the Hun (406-453 A.D.) demanded a ransom of a ton of black pepper when he besieged Rome. Pepper has been used as a currency and also as a medicine - said to cure constipation, diarrhea, earache, gangrene, heart disease, hernia, hoarseness, indigestion, insect bites, insomnia, joint pain, liver ailments, lung disease, oral abscesses, sunburn, and toothaches. Conversely, it contains small amounts of a compound found to be carcinogenic and is known to cause sneezing. Gesundheit.